A Winnipeg father is upset that his 13-year-old son was sent home from school after he refused to wash off his Halloween makeup. 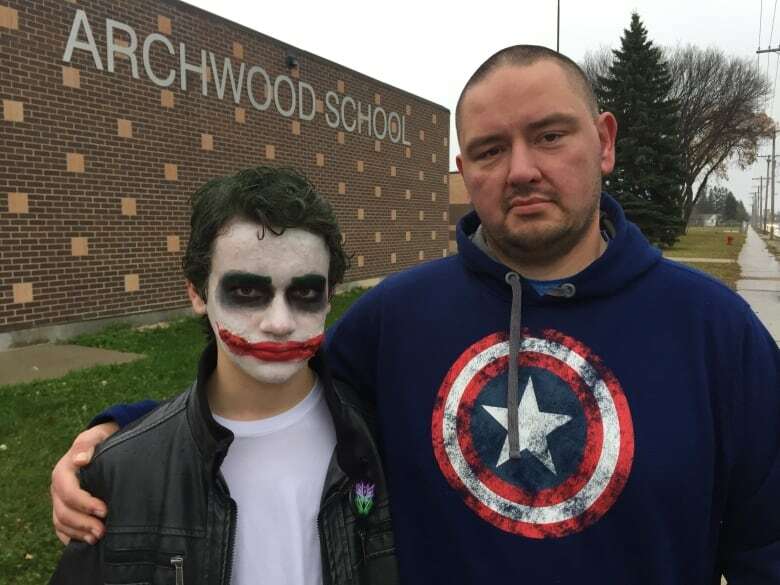 A Winnipeg father isn't laughing after his 13-year-old son wasn't allowed to be The Joker at school. "We were told to leave, stay off the premises, take our son with us until he washes his face," said Kris Stevenson, whose son attends Archwood School in the Louis Riel School Division. Donovan Stevenson went to school Monday morning with his face painted as The Joker character from the Batman comic book series. Donovan said when he got to school he was told he could not wear the face makeup to class. "The principal stopped me and pulled me over and told me to go wash the makeup off my face," said Donovan, adding he told the principal he wanted to call his dad. His father came to the school about 10 minutes later. "I questioned [the principal about] why she was sending him home for exercising his right to dress for Halloween," said Kris. "She said he does not have the right, that he went against what she said." 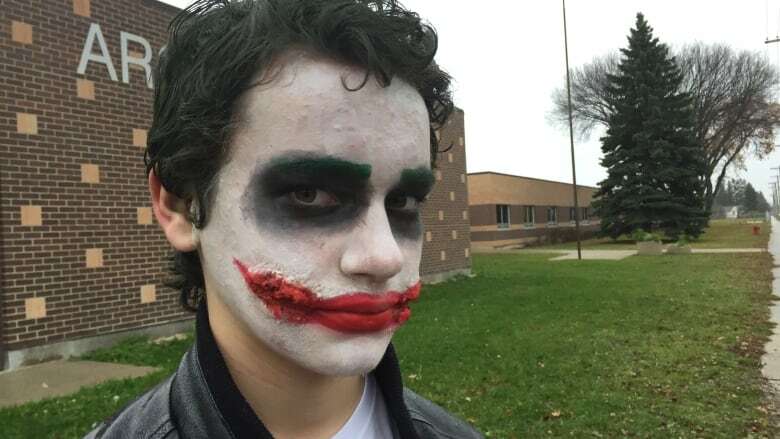 Donovan said he was confused as to why he could not dress up, because he dressed up as The Joker on Halloween last year too, and the school didn't have a problem with it. "I think it's really unfair that I'm not allowed to celebrate what I want to celebrate. It's kind of taking away a part of who I am," he said. Donovan said students were told last week not to wear Halloween makeup or costumes on Monday, because the school would be celebrating on Friday. Kris said the school sent a letter home about an event on Friday called Dress a Different Way for United Way. Students were encouraged to bring a cash donation for the United Way charity if they wanted to dress up. Kris said parents were never told that kids couldn't dress up on Halloween day. He called the principal to clarify why his son was being told he couldn't dress up, but the school never got back to him. "It makes me disheartened that my son can't celebrate something that he's accepted into his culture," said Kris. The Louis Riel School Division said it's up to each school to decide how to observe Halloween and that there is no division policy on costumes or face makeup at schools. Christian Michalik, assistant superintendent, said the division is working with the family and the school to resolve the matter. "It's regrettable that the child isn't in school today, but the matter is such that this is what we are working towards resolving. What exactly transpired, and what exactly was said," said Michalik. "We don't suspend children for coming to school in costumes, and the child wasn't suspended." Michalik said that sending a child home for wearing a costume is not something that the school system would do. "My understanding is no one was sending anyone home," he said. Donovan said there were several other kids who had Halloween clothes on and that the principal told them to wash their makeup off too. "There was a little girl that had cat makeup on, like whiskers, and she was told to go wash it off," said Donovan. Kris said while he was at the school picking up his son he saw two staff members with Halloween shirts on and several small children who were dressed up. He said he saw other parents bringing their kids a change of clothes. "One girl was wearing just a black dress with yellow trim with the Batman logo and she was pulled into the office and I could hear the principal telling her that it was unacceptable," said Kris. Michalik said he was aware of two other children at the school who came dressed for Halloween. They were not sent home but they were asked to change. "I suspect it was about helping a child understand that they would really be the only ones in makeup or dress," he said. Kris said it's hypocritical for the school to pick and choose which holidays they observe, noting that teachers and students get days off for things like Easter or Good Friday. "[Donovan] loves Halloween. People love Christmas, people love Easter, he loves Halloween," said Kris. "If we're talking equality in Canada and we're talking about diversity, why are we censoring the things that Canadian children love?" he said. Kris said he is considering making a human rights complaint or approaching the minister of education about the matter.